Every life is a journey and every journey is unique. There are incidents in our lives that are common to those in other persons’ lives, but the overall journey is as different and distinct as our fingerprints. It is also true that some parts of our journey take place on roads that are rough and rocky while others take place on roads that are paved and smooth. In Halfway Home Jackie K. Cooper takes a look at his journey when he reached what he considered to be the halfway point of his life. He had turned fifty, his kids were teenagers, he had been married for over twenty years. Every day brought something new, while every day was the same. It was a time for thinking about his yesterdays, and a time for contemplating his tomorrows. 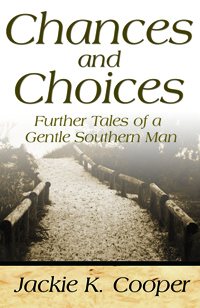 In this book there are stories that reflect his thoughts on his family, friends, and events. Some of the moments captured are funny, some are sad, some are important and some are silly; but all are sure to affect your heart and your mind. This collection of stories from a life’s journey will remind you of times in your own life; times you may have forgotten and now will relive. Jackie K. Cooper’s journey continues and every bend of the road, every spot on the horizon creates a new tale to be savored and enjoyed.